Support your business goals and growth with affordable, high-quality commercial signs and graphics by your local Redford sign company, Salient Sign Studio! As your trusted, leading sign company, we handle every aspect of the sign creation process, including sign design, manufacturing, installation, sign maintenance, and repair. With environmentally sustainable materials and proven manufacturing practices, Salient Sign Studio not only manufactures high-quality signage that is more eco-friendly but also saves you time and money. We look forward to assisting you with all of your promotional and marketing needs. The signs your business uses tells your potential customers a lot about who you are, what you do, and the quality of products and services you provide. 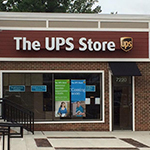 We help get your business started on the right foot, creating attention-grabbing outdoor signs, get your brand remembered with cohesive indoor signage, and make it easier for your customers to navigate your facilities. Salient Sign Studio has the right signage tools that support your business goals, so you can continue to grow your business. 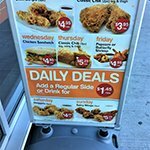 Call Salient Sign Studio today at (313) 314-3677 for your Free Consultation with a Signs & Graphics expert! 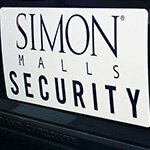 Increasing your average ticket, improving business visibility, and keeping your staff safe and productive, all start with the signs your business uses. With impactful signage tailored to your specific brand, business, and location, you can support your business goals and achieve new marketing success. 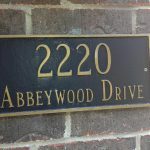 From your free sign consultation through professional installation, Salient Sign Studio ensures that we are creating the right signs to help achieve those goals. 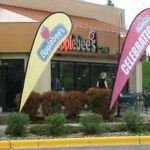 Our consultants strive to understand your business, brand, ideas, and goals in order to provide you with functional signage solutions that work for your business. It takes the right blend of indoor and outdoor signage, and we are committed to getting your business noticed, your brand remembered and helping you improve the customer experience, ultimately improving your bottom line. 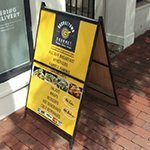 From engaging vinyl window displays to promotional flag signs, vehicle wraps, a-frames, blade signs, hanging banners, yard signs, and more, we have the skills, tools, and resources to help your business stay relevant, competitive, and growing! Your business is unique, from your custom branding to the products and services you provide. So is the best way to make sure that the world knows you exist and have the products and services they need to make their lives better, and that they should choose you as their preferred provider? With custom commercial signage by Salient Sign Studio, you have the right tools to do just that. 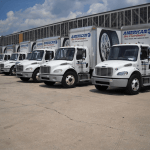 Whether you’re a professional service provider, retail establishment, mobile locksmith, manufacturing company, school, non-profit, or any other business, we provide the assistance, guidance, and experience needed to ensure your business has the right tools for your unique goals. 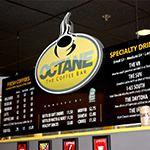 From product samples to digital proofs, we make it easy for you to see how custom signage helps you achieve your goals. 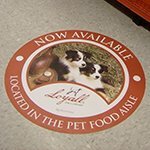 Attractive, custom signage tailored to your unique brand and business is the best way to let your customers know that you’re a professional and have the high-quality products and services they want. So, show your customers that you can deliver the solutions they want and need, with custom business signs and graphics by Salient Sign Studio! 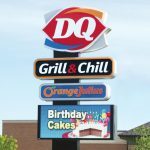 Improve your business visibility, brand recognition, and customer perception with high-quality outdoor signs and graphics by Salient Sign Studio! 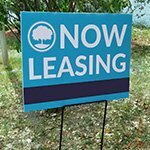 From towering pole signs to custom blade signs, attention-grabbing yard signs attractive window privacy film, we the solutions that get your business noticed. Attracting, converting, and retaining clients and customers begins at your business storefront. This is typically the first place potential clients and customers learn about your business, the products your offer, or the services you provide. This means that the information your storefront offers needs to be informative, attractive, and promotional. 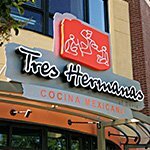 Many companies will require some type of storefront signage, such as blade signs, channel letter signs, backlit cabinet signs, hanging banners, panel signs, awnings, or dimensional letter signs to introduce their brand. 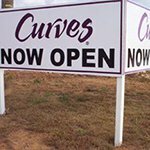 A-frames, hanging banners, blade signs, and panel signs introduce your business name, while window displays and door signs provide information and entice customers to enter. 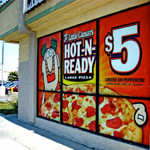 It takes the right blend of these impactful outdoor signs to increase business visibility and improve customer traffic, and Salient Sign Studio will ensure that your storefront spells success. 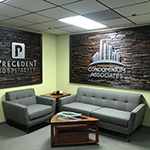 Increase your average ticket, streamline your products, and improve employee productivity with impactful interior signs by Salient Sign Studio, your local Redford sign company! Whatever your goals are, we have the custom signs and graphics that will help you achieve them. 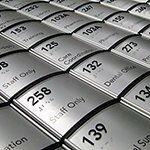 The specific type of indoor signage you need is determined by your unique marketing goals, business needs, the physical layout of your facility, and any legal requirements regarding signage. 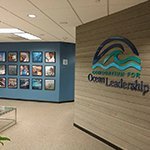 From brand building wall murals to striking full-color wall murals, safety signs, wayfinding signage, and lobby logo signs, we advise you on the right sign options that will support your business. As your local full-service sign company, we handle the entire sign creation process, from expert sign design through fabrication, installation, repair, and maintenance, we make sure your signage is professional, cohesive, and targeted at supporting your marketing goals. Not sure what type of indoor signs will help support your goals? Salient Sign Studio offers on-site evaluations to help determine the right sign types and placement that provide the maximum support for your business goals. Taking business and brand visibility to the next level is what we do! 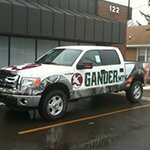 We custom create attractive, branded vehicle wraps to help you get the word about your business spread wherever you go. 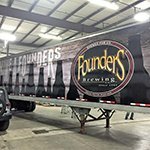 Salient Sign Studio provides complete wrap services for your fleet of vehicles. 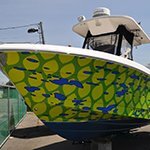 From design through professional installation we can brand any vehicle you have, including tankers, semi-trucks, RV’s, buses, smart cars, ATV’s, motorcycles, golf carts, and more. Our beautiful wraps not only look beautiful in every weather condition but also provide a layer of protection your car’s original paint job. 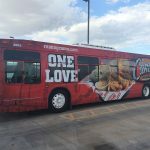 Whether you’re stuck in traffic, headed to work, or parked for lunch, your vehicle is hard at work advertising your business. 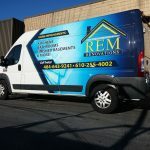 Food trucks, mobile locksmiths, exterminators, lawn management services, contractors, and many other professionals depend heavily on their vehicles for brand promotion and business identification, but that doesn’t mean they’re the only ones who can benefit from branded vehicle wraps, graphics, or magnets to get their business noticed. 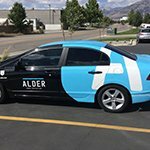 Whether you own an e-business or a computer repair shop, our vehicle solutions will help spread the word about your services! 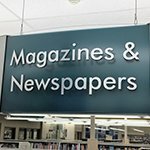 Salient Sign Studio knows that when you want signage that reflects your unique brand and needs, mediocre signs from a big box store just won’t cut it. 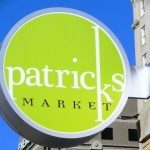 If signage is to be truly effective, it needs to not only complement your brand but also be cohesive with both your brand, location, and business type as well as meet your needs, budget, and timeframe. That’s why we take all of these into consideration when recommending the right blend of custom indoor and outdoor signage. 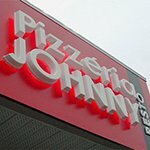 Whether you’re looking for an attractive lobby sign, or a unique, wacky graphic design in mind, Salient Sign Studio will handle every aspect of your sign project to deliver the perfect custom sign for your unique need. 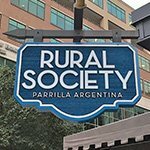 Specialty signage is the best way to get something that truly stands out and accurately reflects your unique brand and business. 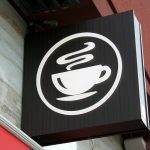 From adding lighted elements to sandblasting, carving, etching, and even burning most mediums, we make sure that your custom sign is tailored to business and matches your vision. 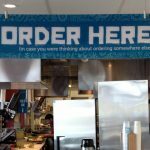 From single custom graphics to an entire collection of interior signs, as a leading sign company, we provide the perfect signage for your marketing and business goals. Salient Sign Studio can’t wait to show you how custom signage will help support you in taking your business to the next level. 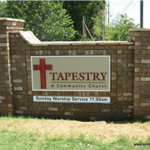 Few sign manufacturers are the complete package, offering professional sign design, fabrication, and installation. 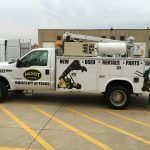 As your one-stop shop, we not only provide those services we even provide sign repair and maintenance, so you never have to go from one shop to the next, hoping that your project gets finished on schedule and within budget. Everything you need is right here, in our local Redford office. 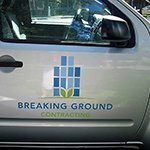 We begin your project with a free consultation, so we can discuss your business, brand, ideas, and signage goals. 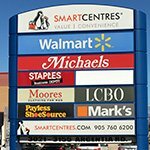 This early insight allows us to provide smart recommendations, tailored to your business and ensure that your signage solutions fit your needs. Our consultants work alongside our graphic designers, making the transition from vision to design concept as fluid as possible. Our design team will then create a sample draft of your vision for you to review and edit as desired. Salient Sign Studio is focused on producing environmentally sustainable signage products through efficient, proven business and manufacturing methods. By utilizing our state-of-the-art machines and environmentally friendly materials, we create eco-friendly products, conserve energy, and save you time and money. Do you have an old sign that’s starting to show it’s age, or one that is in dire need of some attention? Whether your sign has a chipped edge, cracked frame, or some of the elements aren’t lighting up, our professional sign repair staff can help you determine what would best fit your unique situation and get your sign back into shape! From sign repair to element replacement or sign removal, Salient Sign Studio is your trusted sign partner. At Salient Sign Studio, we understand what impact the quality of your signage has on your ability attract, convert, and retain customers for your business. That’s why we have an unwavering commitment to excellence, creating the signage your business needs. 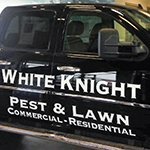 When you need quality signage done for your business, then we are your local, trusted Redford sign company. 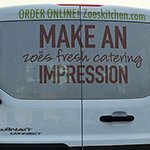 We create a wide range of indoor and outdoor signs, from attractive storefront signs to vehicle wraps and everything in-between. Our consultants and project managers look forward to hearing from you and creating the signage solutions that help you continue growing. 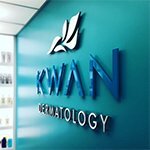 Contact Salient Sign Studio today at (313) 314-3677 for your Free Consultation with a Signs & Graphics expert!